You may want to check also the first part. To the credit of my seller, the printer came with a few special improvements from the real machine. To his discredit though, freely using the name Ultimaker is illegal, and I am far from sure that he released these modifications under an open hardware licence, as required by the initial designers of the Ultimaker. As a general rule, consider also that your free support should come from your seller and especially not from the company that got abused in the first place! Beyond a few pre-assembled parts such as the X/Y blocks or twisted stepper cables and the complex hot end, there were two noticeable differences from the stock UM : the filament feeder had a robust and bigger quick connector (and thus, required specific wooden parts that were initially forgotten in the package), and more interestingly, the pre-assembled hot end proved to be better than the original hot end (but not than the new official and better rev3) ! Here is the fully assembled hot head, and it really looked like what became a few months ago the much better Ultimaker V2 hot end, which is now a standard on real Ultimakers. It is a bit of mystery to me how I got this design so early, as I would not expect this from a Chinese copycat. Anyhow I really enjoyed the design and did not suffer from the issues many seemed to had before the official revision. The bowden tube comes into the head and conveniently stops at the top plate. It gets secured in a brass quick connector, which itself is screwed into the plywood (it really acks a real nut here). Then, a second short piece of bowden tube goes from the bottom of the brass quick connector to the bottom one, where it gets plugged into a white plastic clip. This clip has a blue plastic circlips to prevent any movement, just like someone did on thingiverse for the feeder quick connector. This head gave me only three filament issues in 6 months! The first two happened when I removed the filament probably too slowly : a blob of plastic had time too cool down in between the top and bottom plate, and it would not go through the top brass quick connector. I just had to unscrew the connector, cut the filament and re-screw the brass plug in the plywood. This seems to be fixed now. Actually, the UM license doesn't allow commercial use, so the eBay sellers are in violation with the license no matter what they do. The quality of eBay kits ranges from good to very bad. Anyhow, and that is fine, the seller stopped selling the clone as far as I know. I've also added a link to the latest Ultimaker hot end official revision (2012-11-05), since it outperforms this head anyway. The goal of this post really was to showcase the possible differences and feed back the community. Now I am still a bit uncomfortable about why an opensource licence prevents any kind of sale, apart from Brand name & copyright though. Eg. UM itself is selling the kit, or Red Hat is selling service over open source software. Would you or someone at Ultimaker have a link explaining this with much clarity? Although you're buying from someone you happen to know is selling a clone, not everyone will know this is the case. You're effectively sponsoring a seller who confuses people by using a (brand) name we spend lots of energy, time and money to build. The fact that we have spent a 5 figure number to limit misuse of our name hints at the kind of investment that is meant to defend. It is a 6 figure number, but also 25 people's favorite jobs. We don't want to keep people from innovating in this name. We just want customers to be treated fairly when they buy a product and not lose reputation through a clone product. Actually I did not buy my printer with this state of mind. At the time I would have had to wait for months from your company, I was in a hurry and I even bought almost the same price tag as the real & official printer. As said, I was confused by the "open hardware" policy, and I failed to realize that it was plain wrong to use your brand name. It is also not very ethical, but I did not realize at that time neither that Ultimaker was not a non-profit organization, sorry for that. - many of my designs are related to the Ultimaker (1K+ downloads a month on http://www.thingiverse.com/search?q=mooncactus). This probably helps your customers feelings that they get an active and willing community. 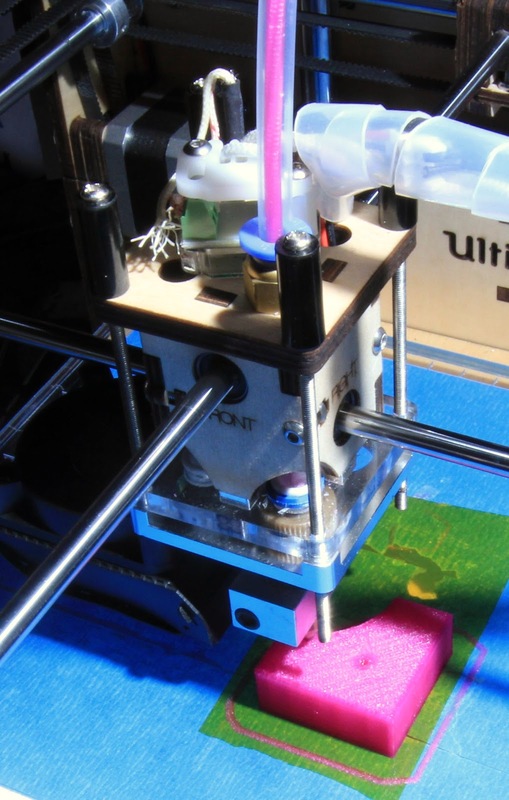 - I also participate significantly in the Google ultimaker forum, and posted some ideas in the "modification and hacks" official Ultimaker forum. - the first third-party plugin for Cura was, I think, my wood shades. This promotes also the very Ultimaker-friendly Cura (which is now officially sponsored by Ultimaker btw). By the way, my wooden owl was featured on wired.com, where it stands on the corner of my Ultimaker. I happen to know about most of the nice and impressive things you've contributed and now I know there are even more. I should have mentioned that my earlier message was not meant to place any blame or you. I just explained that a new buyer of a clone product that knowingly chooses a clone should understand that this has implications. Your case was different. I think you end up getting customer support and community acceptance because you've deserved/earned that.